After the Gulf War in 1991, the Kurds of Iraq rose against Saddam Hussein’s genocidal regime. Their brave but short-lived rebellion led to the setting up of the Safe Havens in northern Iraq. During those heady but precarious days, Teresa Thornhill journeyed twice to Iraqi Kurdistan. She travelled widely with her peshmerga guard, spending time with displaced villagers, widows of the genocidal Anfal campaign, members of the newly-formed Kurdistan regional government and a handful of Kurdish intellectuals. Teresa sought out and met many Kurdish women, including survivors of the 1988 poison gas attacks on Halabja which were masterminded by ‘Chemical Ali’ (Ali Hasan al Majid, later executed after the fall of Saddam); and a mother who openly described her role in the honour killing of her own daughter. Teresa found herself deeply moved by the Kurds she met. 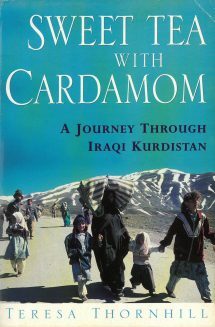 Sweet Tea with Cardamom: a Journey through Iraqi Kurdistan records with insight and passion the land, the people and the struggle at a unique moment in the fight for a free Kurdistan.